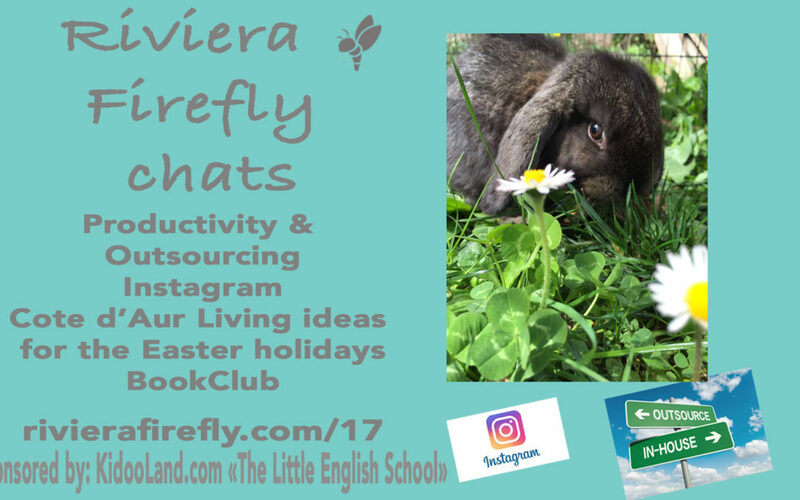 TITLE: Outsourcing, Instagram tips from Riviera Nannies, Holiday ideas and Book club. In this episode Antonia tells a story about how even the best laid plans go wrong! She also chats with Hanna Schar about using Instagram and sets you a challenge. She shares some ideas and tips from the Cote d’Azur Living Facebook group on things to do in the April vacation here on the French Riviera and ends with some holiday reading .. for fun and for business! 1) Plans do not go to plan. 2) People won’t necessarily share their dirty washing on Facebook but everyone has challenges and you just have to pick yourself up and dust off ..move on. 3) don’t be afraid to ask for help. .. but make sure you ask help from the people that will bring you support and raise you up ..avoid the naysayers when things get tough. The Other Hand / Little Bee by Chris Cleave..
First I’m going to tell you a short story? Once upon a time there was a mum called Antonia she had 2 gorgeous teenagers a handsome husband . When she wasn’t busy being a mum and runner of households she had her own company to run looking after 150 other children every week . One month , it was March .. despite all of the Kidooteam’s excellent planning (because they really didn’t like firefighting) they decided they had to make a strategic change . This was a fairly big unplanned change and would mean they all had to redo lots of planning .. such a pity as they had already been planning for A but that this new opportunity was going to make them happier in the longrun even if it meant replanning. So they had to put other projects onto the back burner for a while and work on the new strategy. Luckily Antonia had a fantastic team , 10 supportive , positive and happy team members all pulled together with ideas on how to make things even better than before and as one of the team said “Things happen for a reason” .. so they got to work .. even Brexit couldn’t keep them down for long ? Along the way there were more challenges ?..a podcast interview that had to be cancelled , thunderstorms that did lots of damage to fences and gates in Antonia’s home and so lots of time was spent doing jobs that were urgent but not anticipated. Of course with Murphy’s Law this meant that the teenagers also chose this month to do their very best Harry Enfield Kevin impressions (do you tube the Ken becomes a teenager for a reminder) . What challenges you makes you stronger Antonia kept muttering to herself. The long intense days replanning and with 2 Kevin’s at home Antonia was getting too tired to come home and have to work on geometry or Spanish vocab..and then the clocks changed oh la la? An idea had been bubbling in the back of her head for a while .. her own business coach had told her outsource more .. outsource the things you don’t like doing. You are the CEO of your company in charge of strategy not the doer of everything. Gradually she gave more and more responsibilities to her team . They liked this as they were able to show how brilliant they could do these more important jobs. They felt trusted and valued. Antonia was happy too because she had more time to go out and do networking with other CEOs and find out how they did things. Suddenly from nowhere appeared the Fairy Godmother “Google” ..I can help she said and sure enough she did ?together they created a job advert to find someone to do the laundry and all those tasks that Antonia didn’t want to do anymore? not only would this make Antonia really happy but it had a knock on effect which in turn would make Mr B happier, the teenagers who really were just exhausted from their day where they leave the house at 7 and often don’t get back until 6 wouldn’t have so many weekend chores. She felt so much happier when she pressed publish on the advert and wondered why she hadn’t done it before. Looking back at her 12 week goals from January she realised she was just about to cross off another objective she had set herself. It felt so good to be able to free up more of her time to do more things she was good at and enjoyed. Tune in next time to find out how the interviewing process and find out if they are going to live happily ever after!! Well I hope you enjoyed that short story. Here are the key takeaways .. Thanks to my mastermind chat today I am going to Upwork to outsource some digital work and free up more of my time. I asked for some ideas for the holidays in the Cote d’Azur Living Facebook group and here were the top 3 .. Check out the 1st ever month long garden festival on the Côte d’Azur looks great with pop up gardens, show gardens, gardens open to the public and more. Scape Design are presenting a garden in Nice and won the Professionals Prize for their entry. I love Roots great atmosphere and it has a great range of beers ..if you’re the designated Driver then I can recommend their spicy ginger ale ? delicious! Heliar Monaco are running a promotion in April go and do a taster session for just 35?! Feel free to join in the discussions and the top liked answers will get a shout out in these pods. Check out this episode!